Pruning pomegranates – The magnificent pomegranate shrub (or tree if you want) reminds me some times of a rose bush. The thorny stems, the strong red color of the fruit… but never mind that, that's just me. Pomegranates are a must in every garden, and an absolute must if you have an edible garden. In fact, pomegranates are so easy to train and care for that if you don’t have a garden you can grow them in a container on your porch. 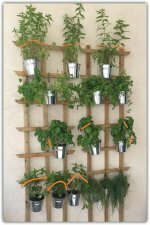 As long as you don’t miss out on the chance to grow this fantastic plant. 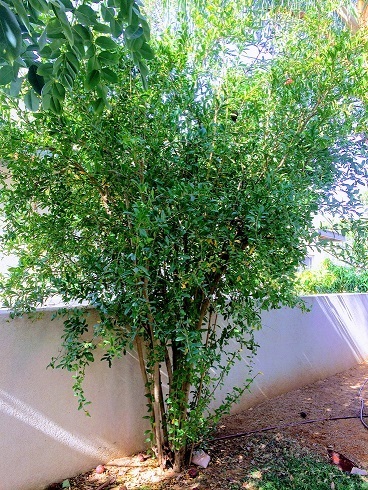 As you can see here, I design my pomegranate shrub to look more like a tree. I could have kept it low and shrubby looking, but because I love the plant so much, I decided to let it have more space in our garden. But, all that is about to change, my pomegranate plant is about to donate it’s body to study J, after all, we are all gathered here for a specific purpose - pruning. 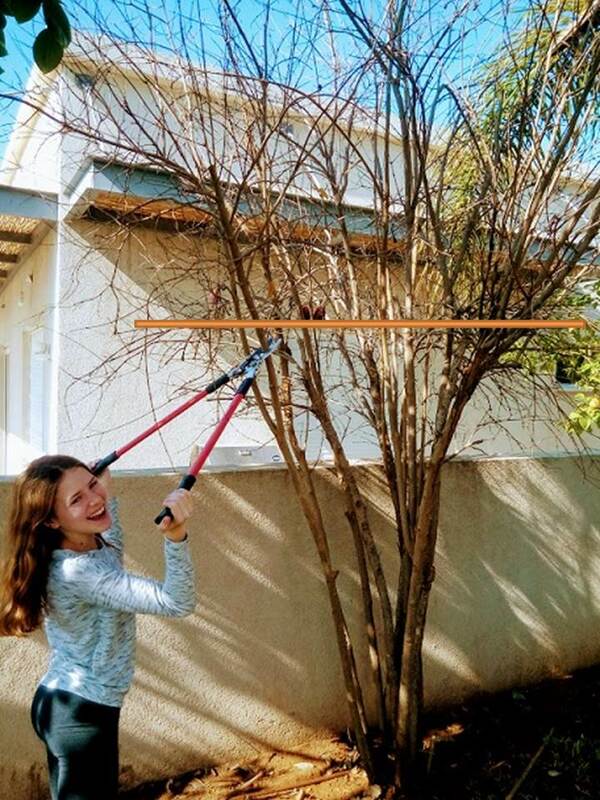 Allow me first to thank Roni, our Handpruning.com house model, without her, you would have a hard time knowing the height of the pomegranate, or other trees for that matter. Roni is 4.8 foot tall , and she will be our scale. So, from the pictures you should be able to get an idea of the height of the trees she is standing with. Thank you Roni. Late winter, just before dormancy ends. Where to prune exactly? 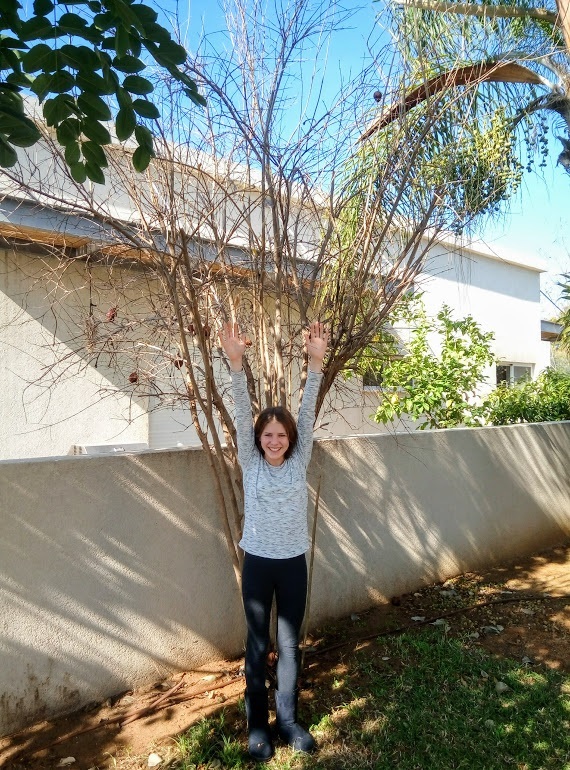 Thanks to Roni we know the approximate height of the tree, though remember, I always recommend to keep your trees low enough to allow you to care for them and reach the fruits. 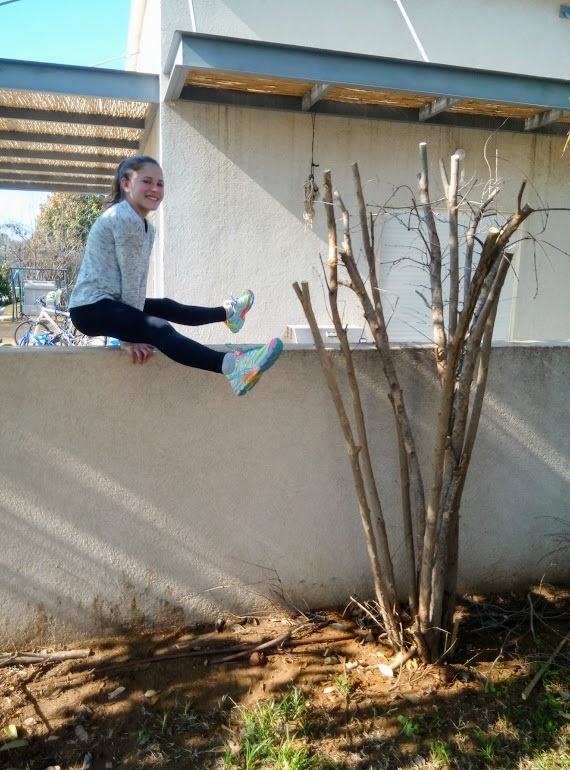 As you can see in the picture, I've already marked my new desired height, now I’ll start pruning by beloved pomegranate tree, working from the outside and working in a circular pattern around the plant. Why? because although my specific pomegranate is very tall, it’s structure and growth are that of a shrub. This means that unlike fruit trees, where I recommend you prune from the tree’s center, pomegranate stems grow straight from the middle (like lots of small trunks) and up. That kind of growth creates one big mess of branches at the top of the tree. So, if you try pruning pomegranate like a citrus tree, trying to clean out some of the nasty branches in the center, you'll find it very hard to pull them away. Back to my original point, when you’re pruning pomegranates first to be cut are the external stems. O.K now what? Grab yourself a cup of coffee and relax. I know the haircut I game my pomegranate is a little shocking, but don’t panic, in a few short weeks you'll understand me better, and I believe you’ll thank me. And if you won’t my pomegranate will. As soon as I finished pruning the height and managed to remove all the mess at the top of the tree, I was able to clean the center. Now it’s clean and ready to bask in the sun and fresh air. BTW, while pruning pomegranate you'll probably come across small thin stems and twigs, some are already dead, and you'll recognize them by their gray color and how easily they can be broken off. Prune those close to the stem, where they grow. If you'll come across small fresh stems, with new buds trying to come out, prune those half way up their length. They will soon to become leaves. Before you go…. please don't forget to use a quality pruning sealer on stems wider than a finger (1/2 inch). It will reduce exposure to fungus, cold weather and prevent heat burns. Pruning pomegranate can be tough, but the rewards, that come within a few short weeks, are tremendous. 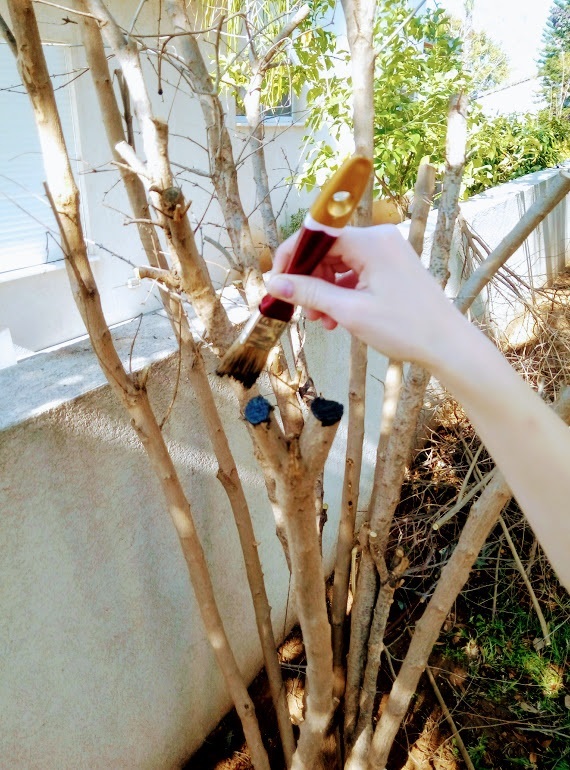 I know there are different views regrade the use of pruning sealers, but in my case, because the haircut I gave my tree was pretty extreme I did decided to use it. The pomegranate skeleton is naked and has lots of new cuts which are now exposed to the cold, the sun, diseases and other kinds of harms. I chose to protect those exposed cuts from potential cold burns and diseases (the sun is less of a problem right now, we are just reaching the end of winter so it’s not too hot yet). The pruning sealer will protect my pomegranate tree and by the time the sun is hot and high in the sky the tree will be covered with new leaves which will provide shade and cover to any new cuts.